Only the finest will do for a M·A·C toast to the New Year! Cham Pale is a cuvée colour collection that’s cause for celebration – a Champagne smash, shimmering with all the bubbly optimism and golden glow of the best that’s yet to be, in Eye Shadow, from Brule to Et tu, Bouquet? ; Paint Pots in Chilled on Ice and Let Me Pop, Lipstick in four shades, especially Quiet Please, and Flustered; Lipgelée from Bubble Lounge to Straight to the Head; two Chromagraphic Pencils (NC15/NW20 and NW25/NC30); Eye Kohl in I Get No Kick; Kohl Power in Feline; Nail Lacquer we call Very Important Platinum! ; Studio Fix Mascara, and new Special Reserve Highlight Powder in four shades ending perfectly elegantly in everyone’s favourite: Rosé Olé. All, for every skin tone. To us! Calms and soothes irritated skin immediately and over time and relieves sensitive skin while diminishing the appearance of redness, irritation and blotchiness. Over time, the gentle, soothing formula helps reduce the appearance of broken capillaries and helps even out skin tone. It contains algae extracts that visibly reduce redness and blotchiness on the skin, both immediately and over time. Kukui nut oil provides moisturization and emollience, while kola seed extract acts as an anti-irritant to help soothe irritated skin. It contains wheat germ and barley extracts that help strengthen the skin’s natural lipid barrier over time. It moisturizes and softens the skin immediately and over time and improves skin tone over time. 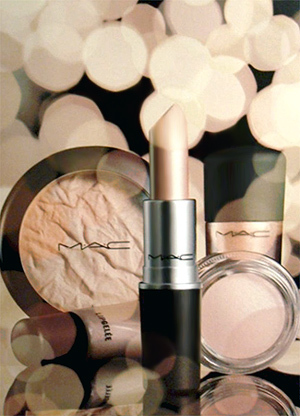 Availability: December 26th, 2010 at all North American MAC locations. January 2011 at all international MAC locations. To check out swatches of the products head on over to Karla Sugar's website (http://karlasugar.net/2010/12/mac-cham-pale). She has taken the time to do some fantastic swatches of the up coming products!